The NEW CD of the band is out!!!! The Band: Chris Cheek on tenor sax and effects, Gerard Kleijn on trompet, voice and effects, Joost Kesselaar on drums and Guillermo Celano on guitar. Brighton Fringe Festival (Brighton, UK) – every night from 21 to 27 may. Horacio Garcia al contrabajo, Felix Morales a la bateria y Cesar Latorre al piano. On tour in Catalunya coming week. Marc Baggiani me are joining forces once again with Gorka Benitez (tenor sax) to make some original music. We will be playing together in trio setting for the fist time!!! 4 | C.B.G feat Luca Tondena (tenor sax) and Dimitri Skidanov (double bass). Big Bang Bar, Barcelona – Catalunya. 5 | C.B.G Sunset, Girona – Catalunya. 6 | C.B.G Contrabaix, Sant Cougat – Catalunya. 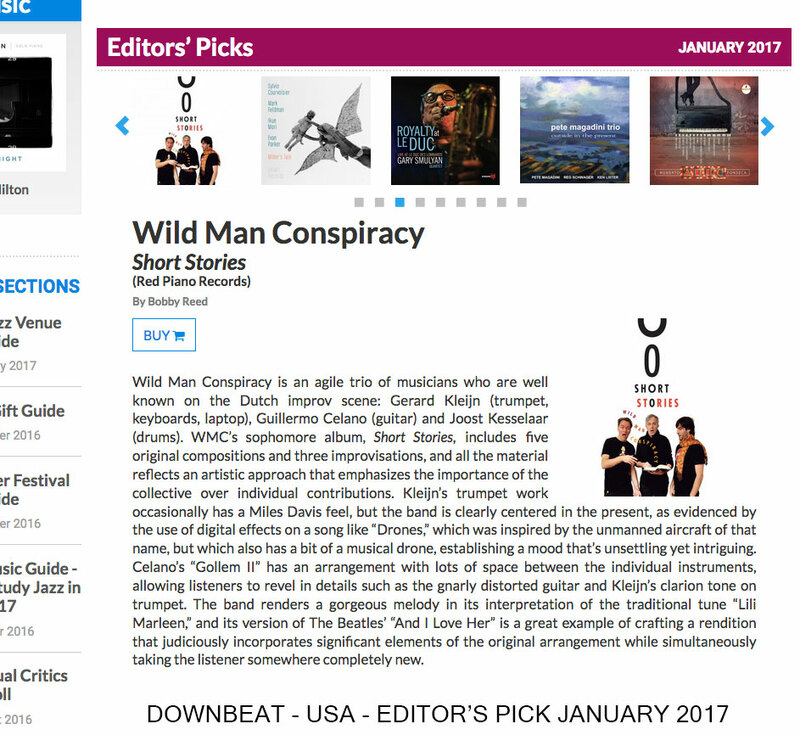 Wild Man Conspiracy march 2018!!! Tuesday 30th january – Masterclass Hochschule für Künste BremenTuesday 30th january – Jazzclub – Bremen – 20.00 h.
Saturday february 17th – Artishock – Soest – 20.30 h.
Friday 16th march – WMC feat. Chris Cheek – De Pletterij – Haarlem 20.30 h.Saturday March 17th – WMC feat. Chris Cheek – LantarenVenster – Rotterdam 20.30h. Tuesday March 20th – WMC feat. 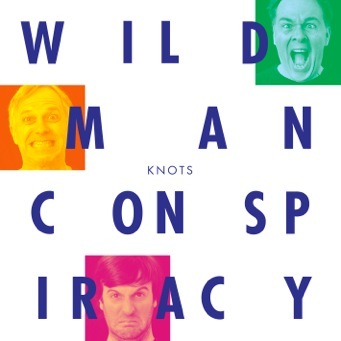 Chris Cheek – Theater ‘t Hof – Arnhem – 20.30 h.
WILD MAN CONSPIRACY in Spain! Yes!!!! We won!!! we got the Golden award with the music/theater play “My Father Held A Gun”!!! De voorstelling My Father Held A Gun van Sahand Sahebdivani, Raphael Rodan, Guillermo Celano en Iman Spaargaren heeft de Amsterdam Fringe Gold Award 2017 gewonnen. Dat werd gisteren bekendgemaakt op de feestelijke afsluiting van het festival dat dit jaar 9000 bezoekers trok. We are presenting the new CD during the tour! Coming out on Kuai, an Argentinean label. Our first CD is coming out in 2017!! 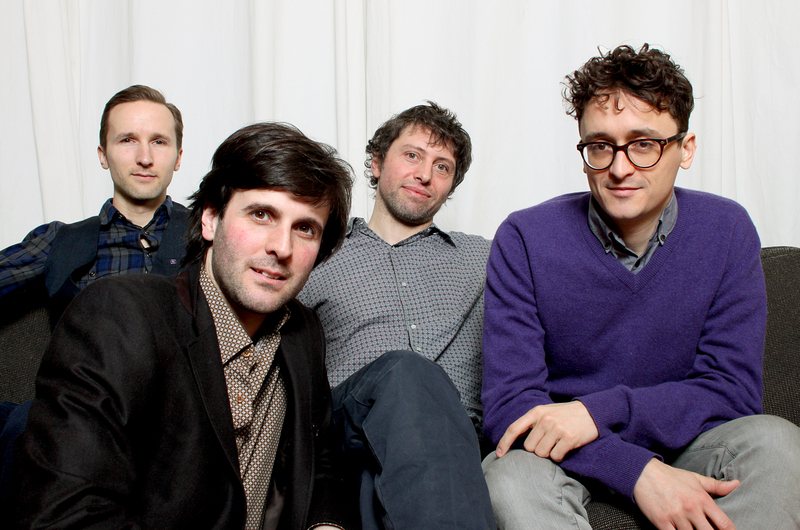 The Band: Gerard Kleijn on trompet, voice and effects, Joost Kesselaar on drums and Guillermo Celano on guitar. C.B.G: Joachim Badenhorst on sax, clarinet and bass clarinet; Guillermo Celano on guitar, Clemens van der Feen on double bass and Marcos Baggiani on drums. I’m happy to announce that the new CD of the band is out by Trytone records (March 2016). Check this new and fun project!!! “Erasing Borders” is out by Trytone records. “A volcano that erupts over and over again, mother nature constantly exploding into new forms. Replace the volcano with music and you get the same effect, at least if you listen to CBG: the Celano / Baggiani Group. 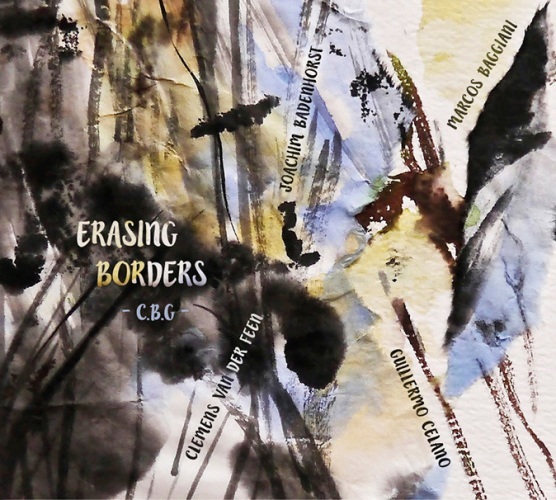 Erasing Borders is an amalgam of different styles, which are connected by the far-reaching improvisational art of the four performers. Without exaggeration, you may call the C.B.G. a “star line-up”. Jazzenzo, Nederlands, june 2015 by Erno Elsinga. “This is both Argentine and Amsterdam music, that much is clear… “Erasing Borders” is a varied album, with heavy grooves, rough tenor saxophone solos and electronic pedals violence alongside graceful, playful and funny moments”. Herman te Loo, JazzFlits, Nederland, June 2015. 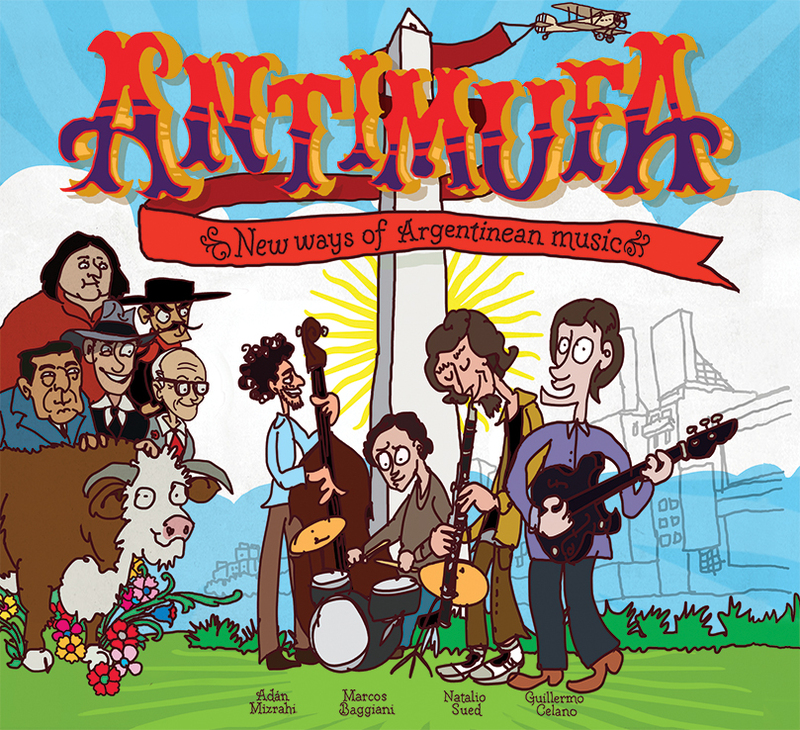 Antimufa: Natalio Sued on Clarinet, sax and voice; G.Celano on guitar; Adan Mizrahi on double bass and Marcos Baggiani on drums and percussion. 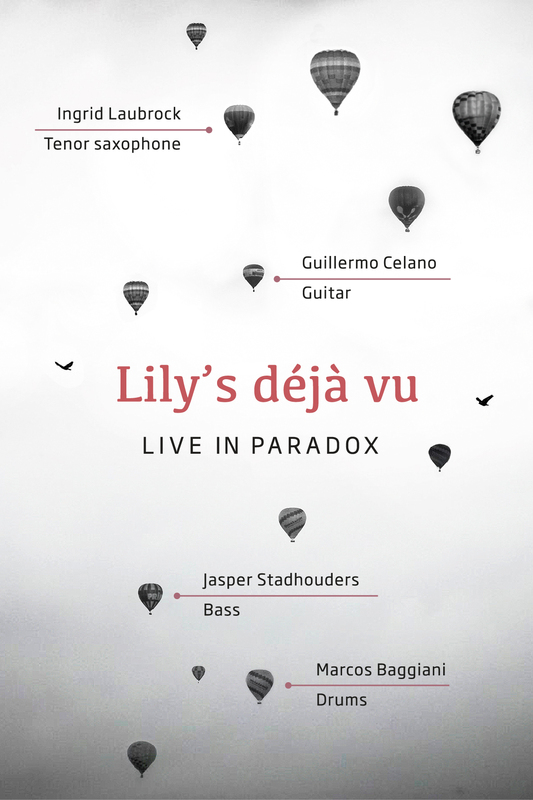 Lily’s déjà vu’s New album is out!!! You can only get it Chorcho Records, or ask me and i’ll send it to you. It is our first Digital album, no CD, just a beautiful postcard with a download code. Joachim Badenhorst on tenor sax, clarinet and bass clarinet, Guillermo Celano on guitar, Clemens van der Feen on double bass and Marcos Baggiani on drums. If you are in the area please drop by for some music and some beer (or whisky). 15 november at 15.30hrs. London Jazz Festival!!! A new trio has been born and the CD is out!!!! !